DARPA's super-resolution vision system (SRVS) works as a super-sniper rife scope. The device allows a sniper to actually see through atmospheric turbulence caused by heat ("heat shimmer") to resolve a distant target. SRVS uses signal processing to take raw images and pick out the ones that are taken during moments of relative clear seeing. 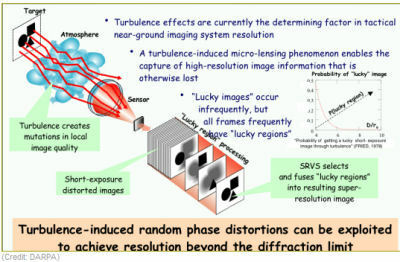 This turbulence-generated micro-lensing then stitches these good frames together to provide a clear view of a target. Those DARPA guys are always thinking ahead; perhaps they could take a tip from Star Trek: Deep Space Nine. In Field of Fire, an episode broadcast in 1999, a crew member is killed under mysterious circumstances. The TR-116a Tactical Sniper Rifle) was equipped with a micro-transporter, which allowed him to beam the bullet into another room only 8-10 centimeters from its target and an exographic targeting sensor which allowed Chu'lak to scan through walls and target victims anywhere on the station from the safety of his quarters. 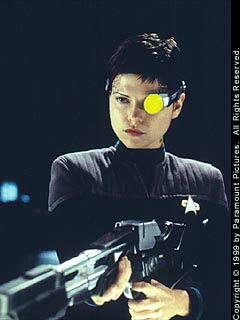 The station's counselor, Lieutenant Ezri Dax, later used a similarly modified rifle to non-lethally stop Chu'lak. From Wired; see also the Visibuilding program.